Leading sporting, cultural and academic figures, including football legend Eric Cantona, have thrown their weight behind a campaign in support of Mahmoud Sarsak, a Palestinian footballer from Gaza who is close to death after more than 80 days on hunger strike. The world professional footballers’ association FIFPro said in a statement http://www.fifpro.org/news/news_details/1954 Sarsak, who had lost about 30 kilos in weight, should be released from jail. He had been detained for three years without charge or trial. His family have not seen him since his initial arrest. In a letter sent on Tuesday to UK Sports Minister Hugh Robertson and UEFA President Michel Platini, football legend Eric Cantona, the UK based Show Racism the Red Card campaign, MIT professor Noam Chomsky, John Dugard, Former Special UN Rapporteur on Palestine and film director Ken Loach, among others, called for the same concern to be shown over racism and human rights abuses in Israel as has been expressed over Poland and Ukraine, the Euro 2012 hosts. 42 Gazan football clubs wrote a protest letter http://www.bdsmovement.net/2011/red-card-israeli-apartheid-7381 to UEFA President Michel Platini over a year ago. They have received no reply. Israeli jails house around 4,000 Palestinian political prisoners, violating Articles 49 and 76 of the Fourth Geneva Convention, which forbids the transfer of occupied peoples (Palestinians), to the territory of the occupier (Israel). More than 300 are "administrative detainees" like Sarsak, held without charge or trial. The letter concludes: “It is time to end Israel's impunity and to insist on the same standards of equality, justice and respect for international law that we demand of other states. 'We are all shocked at the racist chanting at football matches in Poland and Ukraine where Euro 2012 is being played. Footballing bodies and politicians have been outspoken in their condemnation. Indeed some government officials are boycotting group stage matches in Ukraine because of perceived human rights abuses in that country. Israeli government ministers respond to mob attacks on black refugees by denouncing them as 'infiltrators' and calling for them to be imprisoned in military camps. Israeli jails house around 4,000 Palestinian political prisoners, more than 300 of them "administrative detainees" held without charge or trial. 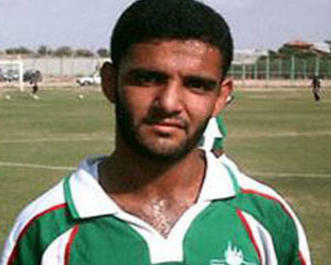 One of these is a footballer from Gaza, Mahmoud Sarsak, aged 25. He has been imprisoned for nearly three years. No charge, no trial. In desperation, he has been on hunger strike for more than 80 days and is now close to death. He, and all victims of abuse by the Israeli state, need our support. 6. Israel’s interior minister Eli Yishai denounces black victims of mob violence as “infiltrators” and says refugees should be imprisoned, “all of them without exception."